Mr. Ang was one of the first enthusiasts who Acoustic Frontiers designed and created a home theater for. A case study on his project can be found here: AN ENTHUSIAST’S FIRST DEDICATED HOME THEATER ROOM. 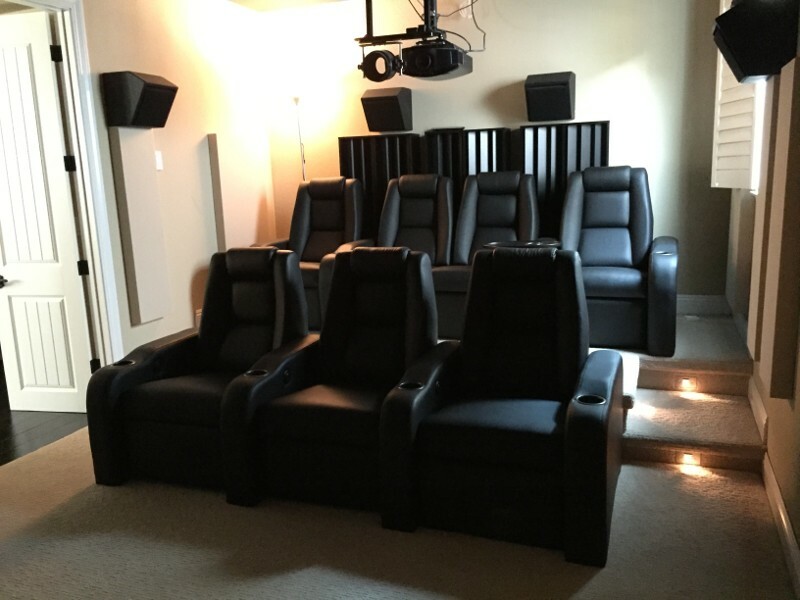 Creating a home theater riser and installing “proper” home theater recliners has been high on Mr. Ang’s list for many years. Of course when the time came Mr. Ang contacted Acoustic Frontiers for the design. We supplied home theater riser construction level documentation to allow a third party carpenter to construct a riser for Mr. Ang. Our typical design documentation for most aspects of home theater design is schematic in nature. 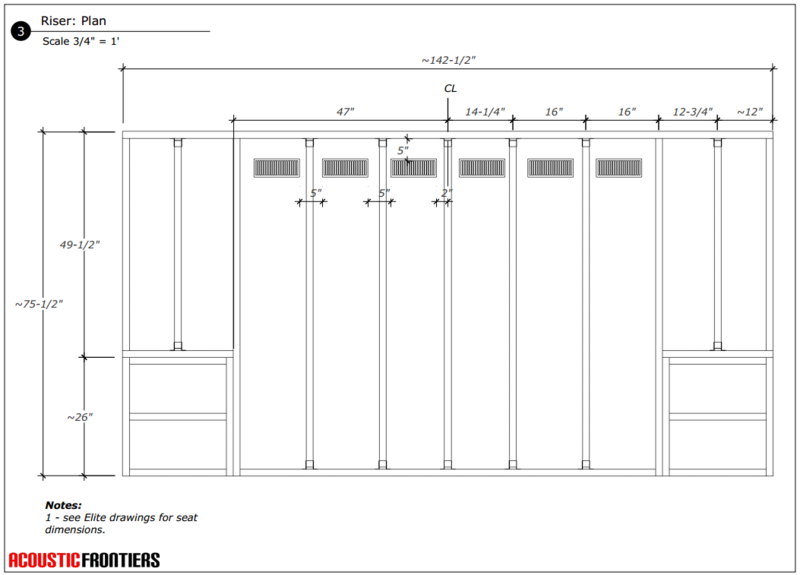 We do, however, create much more detailed construction level documents – or blueprints – for key parts of the theater, including sound isolation, screen / baffle walls, risers, HVAC supply / return mufflers, etc. Most contractors do not have the specific experience of how to construct these elements, and as they are so critical to the final performance of the theater, it is imperative that they are designed properly. Screen / baffle walls are perhaps the most complex to design, as they need to hold speakers and screen in the right position whilst providing a good acoustical environment. 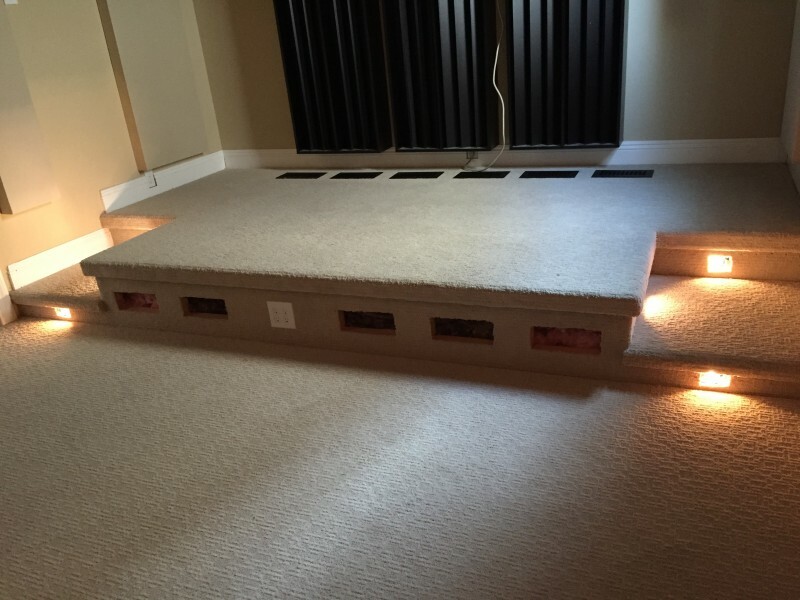 For home theater risers, the key things are to create a structure that does not resonate, buzz or rattle. The air volume inside risers can also be used to provide additional bass trapping. This is typically done adding cutouts in the riser for “venting”. These vents are normally covered with a HVAC register with black acoustical fabric on the bottom of it. The high volume to open surface area ratio naturally acts as a low pass filter, providing absorption in the lowest frequencies only. The percentage open area must be calculated, as must the internal volume, and the number and placement of vents engineered to create the desired low frequency bass trapping effect. Just cutting a few vents in here and there will not turn your riser into a bass trap, there is some definite engineering that needs to take place here! Example of a construction level piece of documentation, in this case the framing plan for a riser. The riser was constructed by a contractor that Mr. Ang found locally. The riser was covered in carpet and included step lighting. The seats used were Elite’s home theater recliners.